March 24th 2012 - "I was bleeding when the news came that he had been killed. I stopped within the hour and I haven't had a period since. I was 38 then; I'm 62 now." Menopause is the cessation of menses. In some books, it is nothing more than that, and what I call the "menopausal years" gets demoted to "peri-menopause" (a word I intensely dislike, having seen it arrive just as women were claiming the power of their menopausal years). The Crone does not menstruate. If your periods stop during your menopausal years, no remedy is needed. Even if they start again, and stop again. . . . 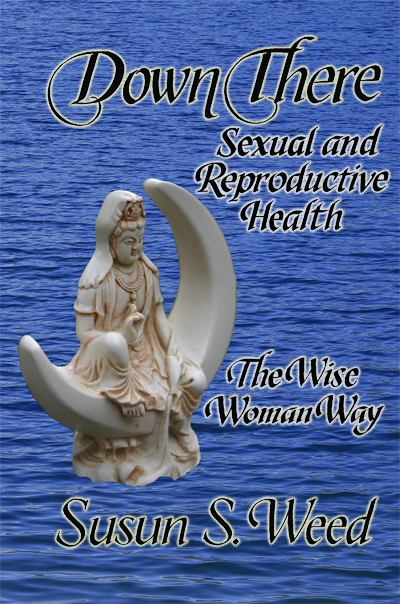 I have met quite a few women in their late 40s who are eager to have a child, and want to prevent the cessation of their menses until they had achieved their goal. A woman at one of my workshops said she had a child at 53, three years after her last period. To our wail of outrage and surprise, she laughed and advised: "Stay away from new lovers during menopause!" When not associated with menopause, lack of menstrual flow (indicating, usually, lack of ovulation as well) is called amenorrhea, and constitutes a severe health risk. Bone loss during one pre-menopausal month without menses is the equivalent of one year's bone loss post-menopausally. The most common reasons for the menses to disappear before menopause (excluding pregnancy) are lack of body fat (from eating disorders or heavy athletic training) and stress. These remedies may be used by women of all ages. If menses cease due to loss and grief, try homeopathic Ignatia. If after a severe emotional shock, try Natrum mur. Nettle leaf infusion has reportedly returned the monthly flow to women drinking it regularly, even in their 60s! If menses stop due to lack of body fat, increase the amount of olive oil and butter in the diet to at least 4 tablespoons a day. If emotional upheaval has stopped your menstrual cycles, seek supportive counseling or a therapy group to help you work with your grief, anger, and repressed memories. Dong quai (Angelica sinensis) root tincture, especially when combined with white peony root (Paeonia albiflora) and licorice (Glycyrhizza glabra), is a superb remedy for women whose menses cease unaccountably. Let a daily dropperful or two nourish your "palace of the child" and help you establish regular cycles. CAUTION: Avoid dong quai if you are prone to flooding, or have fibroids. Acupuncture treatments can be quite useful in re-establishing normal menstrual/hormonal cycling. Strong pennyroyal (Hedeoma pulegioides or Mentha pulegium) tea, a cupful/250 ml or more a day, for the three days of the new moon, can stimulate menstrual bleeding and restore regular cycling. Supplements of vitamin E, 200-600 IU daily, have helped women restore ovulation and menstruation. Consistent use brings best results. Ten or more sessions of Rolfing (body work focused on breaking patterns held in the fascia between the muscles) can restore menstrual cycles for women not yet in the menopausal years.